"I'm thinking about match against Muller, not how to beat Djokovic"
1- José Hernández: Hola Rafa. Last year you made a significant change in your serve and was decisive in the tournament. In this type of court it seems to be a key element. How do you analyze the past year? and how to plant your service in this tournament? Encouragement from Mallorca. Vamos champion! Rafa: Thank you very much. I do not think in the end the draw it was so crucial but it is true that it helped. Nor is it to make a radical change. Things went well. This year I'm trying to win games and get that confidence I'm still lacking. Rafa: I can give you some names that you surely have heard: Nicolas Almagro, Marcel Granollers, Pablo Andujar, Andres Gimeno-Traver ... They are all players who are well known in the circuit. 3. Giulia C.: Hola Rafa! I have read that in addition to Djokovic, Murray has also decided to move to a new diet without gluten. Have you ever considered making any changes in your diet to see if you will benefit, or do you not believe that what you eat can affect how you play tennis? A big hug and good luck in NY! Rafa: I don't know, truly. I'll aske Murray and I'll see it. I do not have a specific diet, but as usual, but within what is an athlete, of course. 4. Zulma Roman: Hola Rafa. I love to watch you play it's a pleasure to enjoy your talent. Why do you play so far from the baseline? Rafa: I like to play close, believe me, but it's not easy. The opponent pushes you back and if you get more you see them go through the sides. But I try to play a more close, more aggressive also. 5. Carlos de Simón: Dear Rafa. As followers and admirers of yours, my son Alfonso and I want to ask you a question. Alfonso, who is 10, has ranking of 13,000 Benjamin, in month og August and he has been training in Marbella- Manolo Santana - in the group competition. He play every day half an hour, but began to have an elbow pain. Would it be good to stop playing for a month? Can it be a problem of the racket, a Babolat Pure Drive? Awaiting your response. 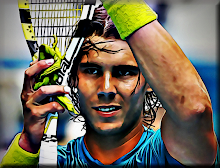 Rafa: Perhaps it would be best to see a doctor to tell you right diagnosis and what to do. Yes I would say that the most important is that for children to have fun playing. Rafa: Sometimes they do show the replay on the screen but in this case they did not. I knew I caught the ball before the second bounce, so I was quiet. 7. Fernando Casas Gil: Hola Rafa, you recently remarked that your tennis doesn't hurt Nole. My question is if you're working a tactic or on a shot to better cope in a final. And if it is true, as Borg said a few days ago that you have a mental blockage against him. Something will have to change, since before the end of those five losses were hard but you used to win more often. A greeting champion. Rafa: My tactic since yesterday till today was to play Nalbandian and from now on until tomorrow is to see how do I play against Gilles Muller. Sincerely, I think like this. 8. Eduardo I.: Hola champ, for whom who likes football so much, what do you think of Mourinho? Don't you think he lack he knowledge how to win and lose? You are an example of that. Good luck. Rafa: Prefer not to give my opinion on these matters, really. There are always people who misinterprets comments and I prefer not to. I hope you understand and thank you. 9. Isa Romero: Hola Rafa, first a big hello from Venezuela, and I know that the people of Latin America loves you. Is it true that you will play an exhibition in December with Nalbandian in Argentina? Good luck in the tournament:) A hug. Rafa: I know that this matter was spoken about but until the end the U.S. Open I prefer to just think in this tournament and then we'll see. 10. Emmanuelle Alveri (France): Hola Rafa. I wonder if in tournaments you can always have all the hours you want to train or there is a limited number of hours of free courts for each player. Rafa: Normally they give a limited time court availability. But it is also true that they treat me very well and I have many options.